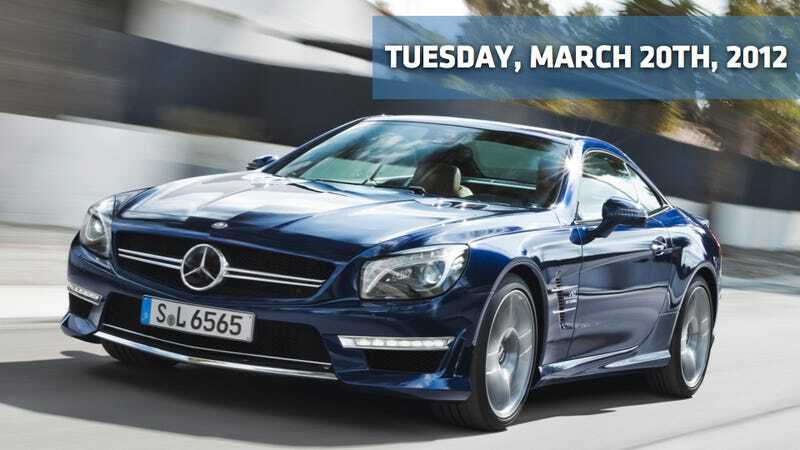 Mercedes-Benz is launching itself into the summer season with the new 2013 Mercedes-Benz SL65 AMG V12 Roadster, debuting at next month's New York Auto Show. With an AMG 6.0-liter V12 biturbo engine that generates a peak output of 621 HP and max torque of 738 lb-ft, this all-aluminum body-in-white badass has gone on a diet, losing 254 lbs. from the last model year. The SL65 AMG joins the SL550 roadster and the SL63 AMG roadster. The SL550 has a starting retail price of $106,375 and arrives in U.S. Mercedes-Benz dealerships in May. The SL63 AMG arrives in July. I want to go to there. Reuters reports that General Motors awarded CEO Dan Akerson nearly $2 million in restricted shares that will fully vest if he stays at the company for three more years. Akerson received 76,249 restricted stock units last week as part of GM's long-term incentive plan hammered out in 2009, the automaker said in a regulatory filing on Monday. Based on GM's closing share price of $25.44 on Friday, Akerson's shares are worth $1.94 million. Each restricted stock unit represents one common share. I must solicit your strictest confidence in this transaction. This is by virtue of its nature as being utterly confidential and 'top secret. We are top official of the federal government contract review panel who are interested in importation of Porsche into our country with Beetles which are presently trapped outside of Nigeria. In order to commence this business we solicit assistance of new car dealerships to enable us transfer into the country the said trapped Beetles. The source of these Beetles is as follows; During the last military regime here in Germany, the government officials set up automakers and awarded themselves automotive ideas which were grossly over-stated by various ministries. The present civilian government set up plans for operation in the capital Abuja, where roads are newly built and the market is good for 911 sports models and where two of Africa's top five richest men are Nigerian. Please,note that George Wills says this transaction is 100% safe. Yours faithfully, New York Times. 4th Gear: Ghosn Confirms Datsun Making A Comeback In 2014 Nissan-Renault chief Carlos Ghosn confirmed rumors that urNissan brand Datsun is making a comeback in two years, according to Left Lane News. Don't let thoughts of sugarplum 510s dance in your head, though, as the brand's mission will be to get the company into developing markets with cheaper (and likely FWD) products. This means the closest we're likely to get to seeing a new Datsun on the street is in South America. That's too bad, I hear it is awesome. The Detroit Free Press reports that Ford on Monday announced the pending retirement of General Counsel and Corporate Secretary Peter Sherry Jr. after 31 years, adding to a growing list of senior executives calling it a career April 1. Sherry, 56, joins product chief Derrick Kuzak and Chief Financial Officer Lewis Booth who also are leaving after lengthy employment at Ford. I hope he's not leaving because of that whole Chevy truck Super Bowl brouhaha. But if he is leaving because of it, then it's probably good he's leaving. 6th Gear: Chrysler v. Pure Detroit Gets "Mediated In Detroit"
The Detroit News reports that Chrysler and Pure Detroit have agreed to a March 27th mediation to try to settle a year-old lawsuit over the clothing company's use of "Imported from Detroit." U.S. Magistrate Judge Michael J. Hluchaniuk gave the parties until April 3rd to report on whether the mediation session was successful. Both sides have agreed to an unnamed mediator.